The hardest aspect of this climb is indeed the drive to the trailhead. You approach the trailhead via Hwy. 238 (from NW) or Hwy. 239 (from N). These roads are both narrow and full of curves. The trailhead is located where the two roads meet. There is a two-level parking garage (free) at this trailhead. The location is N33.86791, E134.08908, elevation about 1380 meter. Walk up and across the street from the parking, you will see a big set of concrete steps leading uphill, that is, one starts out on the left side of the road tunnel. This quite a bit left (when facing uphill) from the lift area. There is a ski-lift that one may use, but its elevation gain is small (and the price is high), so one should really hike this peak from the base. Follow the trsil from the top of the steps as it bears right and after a while crosses under the lift in a small, protective tunnel. There are several trails, but a good route is to keep left and follow the trail that heads mostly uphill. This trail crosses near the top of the lift, then continues uphill and arrives at the summit area via some buildings. Pass the building up on the right, then arrive at a pretty large summit plateau. There are boardwalks up here that will lead you to the highest point across the plateau. After quite a long and winding drive on rather narrow roads, we arrived at the trailhead and parked at the lower level to keep the car in the shade while we would be out walking. We left at 0810 and immediately ran into an official warning. We were not scared and had a nice walk up the hill, arriving at the summit after 50 minutes, at 0900. Good views, but some clouds were drifting around. We left the summit at 0915, deciding to make a circle hike by descending down the trail that heads downhill directly from the summit point. 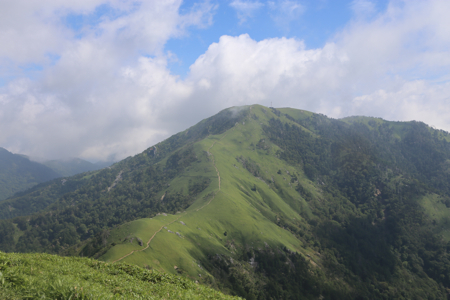 While descending this trail, the nice peak Jirogyu caught our attention. Thus, instead of turning right off the ridge before it levelled out, we continued across the saddle and made the easy climb along a nice trail. We arrived at the summit of Jirogyu 30 minutes after leaving our first summit. This is also a very nice spot with good views down the vallesy as well as across to the main summit of Tsurugi. After another 15 minutes here, we returned the same way, but took the trail left instead of reclimbing Tsurugi. This trail traversed left and actually needed to regain a bit of elevation before merging back with the uphills trails from our trailhead. We were down in 50 minutes after what had been an easy day on a nice mountain.